The World Water initiative is one of UC Davis' Big Ideas. These projects are the centerpieces of the university's capital campaign, designed to support transformative new programs. Water connects us all—on campus, across California and globally. 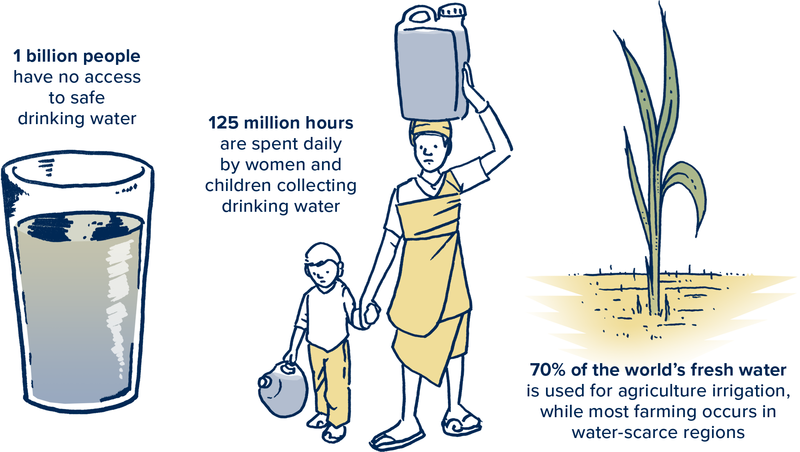 Ensuring clean, sustainable water is an urgent challenge. For more than a century, California stakeholders have addressed complex water challenges while building one of the world’s largest economies and striving to protect the state's diverse ecosystems. California has developed expertise and unique policy tools—a model of innovative water science and management. Inspired by the Netherlands’ highly successful private-public water management model, UC Davis is uniquely positioned to formalize, improve and promote the California Model worldwide. From drought to floods, from safe drinking water to wastewater, from agricultural production to ecosystem restoration, UC Davis is a leader in water-related education, research and outreach. The World Water initiative will bring UC Davis’ interdisciplinary expertise to bear on solving local and global water challenges. Pioneering 21st century water science, engineering, management and policy, this initiative will expand our leadership in managing one of the world’s most precious resources. The California Model of water management—leveraging water science, expertise and policy—will deliver superior solutions for a wide range of water challenges at home and abroad.